Want to make a difference in your energy bill but don’t want to get involved in a huge project? A great place to make a big impact with little effort is in your kitchen and bathroom. We’re not talking about tearing things apart and doing an expensive remodeling project, either. A few small changes in two of the most used rooms in your house can do a lot for your next utility bill. 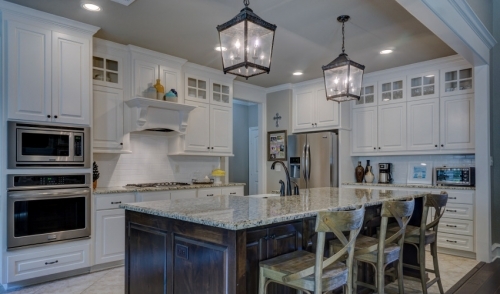 Is it time for a new light fixture? There are a lot of Energy Star rated fixtures to choose from today. Depending on whether or not you need to move the location of the light fixture, this is a project that could be completed in just one evening! Even if you don’t need to replace your light fixtures, take advantage of today’s technology and consider innovative choices like LED lighting under your kitchen counter, or using Compact Florescent Light (CFL) bulbs wherever regular bulbs are used. For your Kitchen, using a high-efficiency ceiling fan is a great alternative to the typical exhaust fan. By moving air through the space using natural ventilation, a ceiling fan uses much less energy than an exhaust fan and is much quieter. If you still prefer an exhaust fan over your cooking area, consider a high-efficiency variable speed model. In doing this, you are able to use the lowest speed available, if it is all you need, thus saving more energy. If you’ve already installed the most efficient lights and bulbs in your kitchen or bath, there is still the option of replacing your regular light switch with a dimmer or motion detector switch --a quick project with big potential savings down the road. While not directly a lighting project, "en-lightening" your kitchen and bath areas with bright colors can help to reflect the existing light that’s already there. Consider painting or wallpapering your kitchen or bath in bright color schemes to get the most out of your ambient light. A large mirror in the bathroom will not only make the room look bigger, the light will reflect back into the room, increasing efficiency. WaterSense is an EPA partnership program that helps consumers make the best choices to save money and maintain high environmental standards. Products that bear the WaterSense label have been certified to be at least 20% more efficient without sacrificing performance. Replacing old showerheads, faucets, and toilets with new low flow WaterSense products can save a lot. You will not only save on water in general, but costs of heating water as well as less hot water will be used. Are your water heater and pipes insulated? Insulating them is one of the quickest and least expensive ways to make an impact on your hot water usage. Simply insulating the water heater could reduce its energy use by up to 9 percent! Putting a layer of insulation on the hot water pipes from the heater to the shower can save another 5 to 10 percent. In addition, you will waste less water while waiting for the heated water to come out of the tap. Are any of your appliances old? If so, chances are that there are more efficient Energy Star rated alternatives available. An Energy Star rated dishwasher can save up to 10% in energy costs per year. Also, if you don’t have a dishwasher yet, consider installing one as your next project. Not only are they great time saving devices, they can save a lot of energy over washing by hand. Old refrigerators can use as much as 15% of the household’s energy and are considered the biggest energy hogs of all household appliances. One word of advice: if you do replace with a new one, simply putting the old fridge out into the garage and plugging it in will only add to your bill! When shopping for appliances, make sure you choose the right size, as there are a lot of compact choices available if that is all you need. Of course, these are just a few improvements that could be easily help save energy while improving the look of your home and the quality of living. Depending on your skill level and budget, you could also consider replacement windows or skylights where applicable. There are many new choices in hot water heating, as well. For example an on-demand hot water heater can be a perfect fit for your lifestyle and save a lot of energy along the way.